The best soil settlement and consolidation tools. A comprehensive suite of tools for analyzing the settlement of foundations and surface loads. 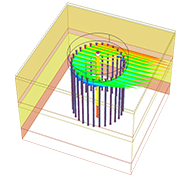 Perform time-dependent settlement and consolidation analysis with Settle and analyze surface deformation and bearing capacity problems using finite element analysis in RS2 and RS3.